When you decide you want to learn sign language, you think it’s just learning the signs and boy, this is going to be easy/fun. You were right about the fun part. What exactly does make a good, proficient signer? What are the things I know that aren’t just the basics? Cause I already know all that. ASL Foundations is the program for you. In just 4 lessons you’ll know what to aim for and how to get there. Using the tips, advice, and encouragement from you, I’m not struggling with my vocabulary, and my signing is becoming better every time I practice. I can finally communicate with my Deaf grandson each week. Words can’t express what this means to us both. He’s telling his parents to use your programs because it’s working for MeeMaw. Thank you for everything and for helping this old lady. What can ASL Foundations do for you? You'll learn the 5 parameters to know the signs accurately & build consistently, so that you won’t walk around signing incorrectly (embarrassing much!?). 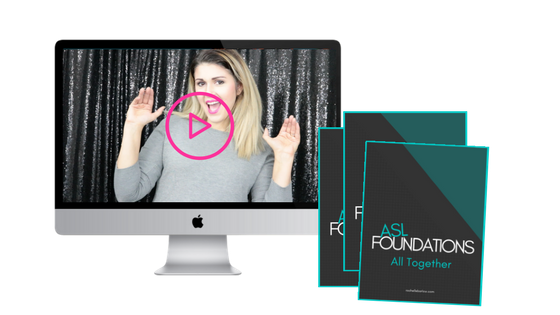 tips + tricks for being a fingerspelling rockstar, learn the secrets to receptive success & smooth, fast fingerspelling so that you don’t look like a newbie AND understand what the heck that person just fingerspelled at you! learn the things you shouldn’t be signing when you’re working on grammar so you stop giving up in frustration because your ASL sentences just don’t feel right, or look like the pros’. You can sign confidently, not worrying about your grammar, PLUS your expressive signing just got covered in glitter and sunshine. Set up a rock-solid foundation, take away the guessing, add in some confidence, some glitter and sunshine, and create smooth clear awesome signing now!